Looking Into Trump Campaign's Russia Ties, Investigators Follow The Money A Senate panel says it will look into a large database of possible money-laundering activities maintained by the Treasury Department to explore Trump associates' links to Russia. 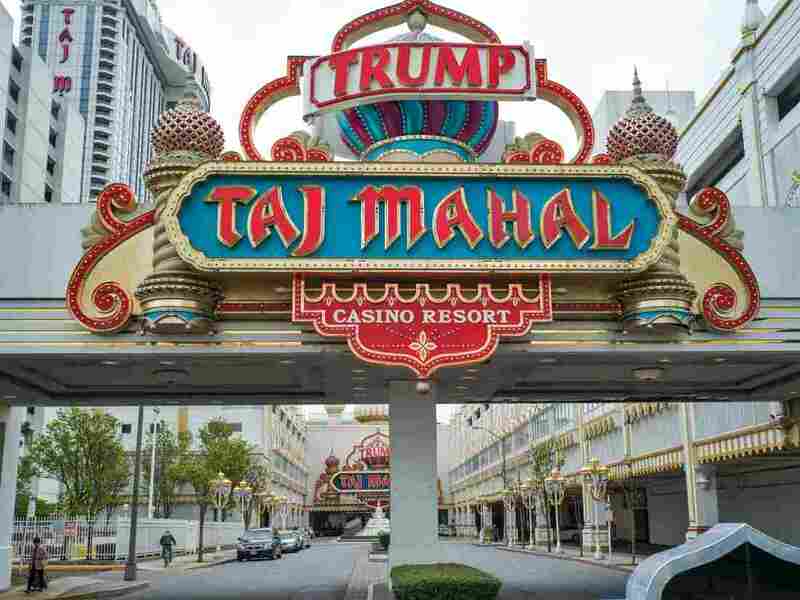 The now-closed Trump Taj Mahal casino resort in Atlantic City, N.J., was repeatedly cited by federal officials for having inadequate money-laundering controls. Investigators looking into the Trump campaign's ties to Russia will be able to pursue leads by tapping into a huge database of suspicious financial transactions maintained by the federal government. Under the Bank Secrecy Act, financial institutions operating in the U.S. are supposed to inform the Treasury Department's Financial Crimes Enforcement Network, or FinCEN, when they see transactions that indicate possible money laundering, such as all-cash purchases of expensive real estate. Senate investigators indicated last week that they would be using the database to begin tracking the financial activities of some of President Trump's associates. "Congress has kind of shifted the focus here to the money, and they're trying to see if there's a money trail that could link and identify different participants," says Jimmy Gurulé, a law professor at the University of Notre Dame and a former Treasury Department official. "It goes to the old adage of 'follow the money.' If there was collusion between the Russians and members of the Trump campaign, was it for free or was there some exchange of moneys or payments from foreign governments?" he adds. Trump made much of his fortune in real estate and gaming, two industries that have been notorious venues for money laundering. The Trump Taj Mahal in Atlantic City, which opened in 1990 and closed in 2016, was repeatedly cited for having inadequate money-laundering controls, not an unusual charge in the gaming business. FinCEN fined the casino $10 million in 2015, although Trump had long before declared bankruptcy and had little real involvement in the property. In more recent years, FinCEN has focused on the real estate business, looking for unusual purchases of properties that indicate money laundering is taking place. For drug dealers and corrupt government officials, there's often no better way to conceal their funds from regulators and tax collectors than by buying high-end properties in places such as New York, Miami and San Francisco, says Mark Hays, who heads the anti-money-laundering campaign at the nonprofit Global Witness. "These make for attractive landing pads, if, say, you're a suspicious person wanted for criminal activity in your home country and you actually need a place to cool your jets," Hays says. Such purchases can be easily hidden by using shell corporations and secret bank accounts, making it harder for regulators to track them, he notes. "You make the purchase [and the] real estate person says, 'Who owns this company?' It's so-and-so LLC. 'Well, who owns that?' That's not on the record. No one knows that," Hays says. That makes connecting the dots in money-laundering investigations more difficult. Still, FinCEN's records of suspicious activities could provide Senate investigators with real investigative leads, Gurulé says. "If I was involved with some criminal wrongdoing related to this investigation, this would make me very nervous," he says.